Bali Bird and Reptile Park with its presence as one of favorite zoo, which is the only one famous bird park with thousands complete interesting birds species collection also reptile park that existed on the paradise island of Bali. from various species more than 250 variations of birds from around the world including Indonesia. conservation and breeding in protecting and conserving endangered species in Indonesia. ...including Pesquet's Parrot and Bali Starling are bred primarily to support local broadcast program. that are protected in Indonesia and other exotic of bird life from around the world. Bali Bird and Reptile Park located in tropical area on a natural green fertile environment with various types of tropical shady trees. precisely existed on Jln. Serma Cok Ngurah Gambir - Singapadu village - Batubulan sub-district - Gianyar regency - Bali province. Bali Bird and Reptile Park very easy to reach, since it is located on the edge highway with access translucent headed straight to Ubud monkey (Native Animal) forest temple (Ubud art village or Ubud palace). or about 20 minutes from Sanur and about 1 hour from Kuta or Nusa Dua area. Bali Bird and Rimba Reptile Park and its restaurant open everyday start from 09:00 am to 17:30 pm, and closed on Nyepi Day (Balinese New Year). local food or international cuisine with setting of a relaxed atmosphere, and decorated with rhythm of beautiful chirping from different kind of birds. Bali bird and reptile park also provides a rainforest cafe to relax for you who visit the zoo park, which located in the heart of bali bird park. The existence of rainforest cafe which serves fresh juices, delicious ice cream as well as the selection various types of drinks and snacks. SEBUN SHOP is a place that providing a wide range of merchandise that can be made as souvenirs, which located adjacent to the main restaurant. (the show starts at 10:00, 11:00, 12:00, 12:30 , 13:00, 13:30, 14:00, 14:30, 15:30, 16:30, 17:00). Bali Bird and Reptile Park divided into seven areas that create the natural habitat of birds complete with the original plant life. The journey from the deep misty forest of Sumatra island to the far eastern tip of Papua Indonesia to find the native birds from remote areas. Crane-storks and Pelicans as well as many other birds which roam freely across the zoo's bali bird park. SOUTH AMERICA HABITAT: Here you can see exotic Array South America like the largest Red Macaw Parrot in the world, the magnificent Hyacinth Macaw. 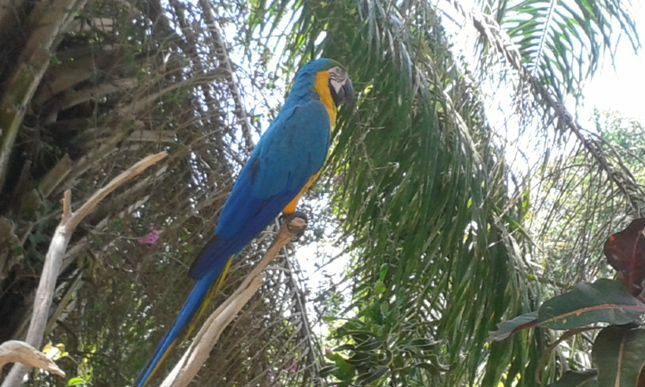 Birds you can see, such as: Scarlet Ibis, Purple Swamphen, Glossy Ibis, Green Winged Macaw, Hyacinth Macaw, Buffon's Macaw, Blue and Gold Macaw, Love Bird, Orange-Winged Amazon, Hans Macaw, Red-Fronted Macaw, Swainson's Toucan. SOUTH AFRICA HABITAT: In this place you can observe African Grey Parrot, known for its ability to mimic the human voice, and other birds of the African savannah. You can also visit the flamingo in the pool and see the bright-pink bird that plunge standing on one of their very long leg. Birds you can see, such as: Violet Turaco, Congo African Grey Parrot, African Crowned Crane, Von Der Decken's Hornbill, Ground Hornbill, Purple Glossy Starling, Starling amethys, Senegal Parrot, Laughing Kookabura. LOCAL SUMATRA HABITAT: You can also visit the situation in Sumatran jungle habitat to see Endemic rare and strange Bird as Eagle Owl, with its pointed sideways ear tufts and powerful claws. Birds you can see, such as: Senegal Parrot, Chrinsom Wing Parakeet, White Crested Hornbill, Bar-Pouched Wreathed Hornbill, Lesser Coucal, Indian Black Hawk Eagle. LOCAL BORNEO HABITAT: Here you can see a wide variety of ecosystems that are owned by Borneo habitat areas - including some lowland forests and highest misty cloud rainforest in the world - and diversity of bird species remarkable. Birds you can see, such as: Nicobar pigeon, wattled pheasant Bulwer, Great argus pheasant, great Javan rhinoceros hornbill, Flying fox / fruit bat, Crested serpent eagle and many more. LOCAL PAPUA HABITAT: You can find these types of exotic birds of Papua and one of the most comprehensive collections in the world, Cassowary living fly in lowland forests dense and Western Corwned Pigeon one of the most beautiful species from family of pigeons, with peak delicate blue lace around her head. Birds you can see, such as: Golden-necked Cassowary, Double wanttled Cassowary, Golden pheasant, Green jungle fowl, Amboina king parrot, Western crowned pigeon, Emerald ground dove, Southern-pied hornbill, Cinnamon ground dove, Black lory, Black-capped lory, Salvadori's black-capped lory, Rainbow lorikeet, White-bellied imperial pigeon, Racket-tailed black drongo, Southern crowned pigeon, New guinea Bronzewing, Chattering lory, African crowned crane, Javan green Peafowl, Indian-blue Peafowl, Yellow napped lory, lory Ornate, Yellow streaked lory, Red bird of paradise, yellow streaked lory, Pesquet's parrot, Red bird of paradise, Twelve-wired bird of paradise. LOCAL JAVA HABITAT: Here you can see the fantastic Javan hawk and Serpent eagles also listen to the sweet sound of bird songs that echoed through the foliage. Birds you can see, such as: Banded ribbon, Asian fairy-bluebird, Asian pied starling, Black-naped oriole, Javan hawk eagle, Southern-pied hornbill, Magpie robin, Sunda scops owl, Fire-tufted barbet, Purple- backed starling, Java sparrow, moustached parakeet. LOCAL BALI HABITAT: In this area you can feel an experience to see the existence of native bali forest birds, to find one of the rarest birds in the world, namely Jalak Bali (Bali starling). The existence of this species is endangered at national bird park, and now regularly has been bred in the zoo of Bali Bird Park as part of a conservation program. Birds you can see, such as: Bali starling, Brown-billed cuckoo dove, Bronze-tailed peacock pheasant, New guinea Bronzewing, Peaceful / zebra dove, Emerald ground dove, flying fox / fruit bat, Black-naped oriole, Purple swamphen, Ringneck white dove, Pied imperial pigeon, Orange-breasted green pigeon, Glossy ibis, Cattle egret, Black-naped fruit dove, Little green pigeon, Spotted dove, Common myna, Javan green Peafowl, Night pond heron, Asian pied starling, Javan myna, Yellow vented bulbul, Australian pelican, Bali starling, Nias hill myna. BALI RAINFOREST (free flight bird show): Here you can see the marvel show is a free flight that displays Bird Macaw, Cranes, Bird cockatoos and other birds, they soar high in the sky, indeed you will feel a tremendous opportunity to see so many different birds in a single environment. Performances event at (10:30 and 16:00). BASIC INSTINCT (Bird of Prey Show): Your imagination will also fly when you meet in the event of a magnificent flying free bird from Eagles hovering, Eagles Ghost, and watch them fly to soar and then dip down. Performances event at (11:30 and 15:00). 4D THEATRE: You will also be entertained with performances Bird 4-D movies in theaters bali bird park. Performances event at (10:00, 11:00, 12:00, 12:30, 13:00, 13:30, 14:00, 14:30, 15:30, 16:30, 17:00). DRAGON EXPERIENCE: Here you can join as a caretaker species of Komodo, the giant lizard animals that are direct descendants of dinosaurs that lived nearly 100 million years ago. Performing the show only on (Tuesday at 11:00 am and Fridays at 14:30pm). GUYU GUYU CORNER (Hands on Birds): In this place you can feel a close and personal experience with spectacular Macaw Bird and colorful Cockatoos that will perch on your shoulder for a chance to take pictures session. Performances event at (09:00 to 17:00). PAPUA RAINFOREST FEED: You can also find the exotic species of Papua birds and one of the most comprehensive collection of paradise bird in the world. Performances event at (9:30 and 12:45). LORY FEEDING: You also could feel to feed the amazing rainbow-colored lories birds with their nect landing on your body.Performances event at (9:45, 12:45 and 13:30). MEET THE BIRD STARS (Bali Starling Restaurant): Feel a closer thoughts with Anna-Maria Black Palm Cockatoo and impressive Wreathed hornbills impressive reared in captivity, so they feel comfortable when in contact with humans. Performances event at (12:00, 13:30 and 16:30). So the above information is a reviews describing about Bali Bird & Reptile Park, and will also be a general overview which is very useful for you who intend and want to hold a fantastic holiday together with friends or your beloved family at Bali Bird and Reptile Park. The renowned place of Bali Bird and Reptile Park is one of the best zoo to do activities adventure sightseeing tour packages that highly recommended by Sorga Bali Tours (Best organizer for Bali holidays - Bali adventure packages, and Bali tour service activities). Besides, the explanation above will be very helpful, and it can also be used as a useful information, for you as a consideration about "HOW", "WHICH ONE", "WHERE", and "WHAT" that should be required in planning to arrange a half day tour or organizing a full day sightseeing tour and how to set a day trip for a fantastic holiday also creates an exciting family vacation, while enjoying view of amazing bird and reptiles at Bali Bird and Reptile Park.